I am addicted to hummus. Everyday around noon my body itches for it. It’s delicious, satisfying, and good for you. I probably eat more than I should in one sitting, but so be it. A great dip demands a great best friend, a cracker. My go to crackers are these vegan Cheeze Seed Crackers. They are incredibly delicious and actually taste cheesy with the addition of nutritional yeast. Their flavour is subtle enough that they can go with pretty much any savory topping you desire. What is nutritional yeast? Good question. Nutritional yeast it’s basically a deactivated yeast. It’s a single-celled organism, Saccharomyces Cerevisiae, which is grown on molasses. It’s harvested, washed, and dried with heat to deactivate it. I agree, it sounds complicated. But I do know it’s high in b-complex vitamins and protein. Vegan’s often use it as a cheese substitute and for it’s umami flavour. I know making crackers sound intimidating, but they are pretty easy to make. They can also be customized with different seeds, spices, or nuts of your liking. Go ahead and impress yourself and your friends with this cracker recipe. 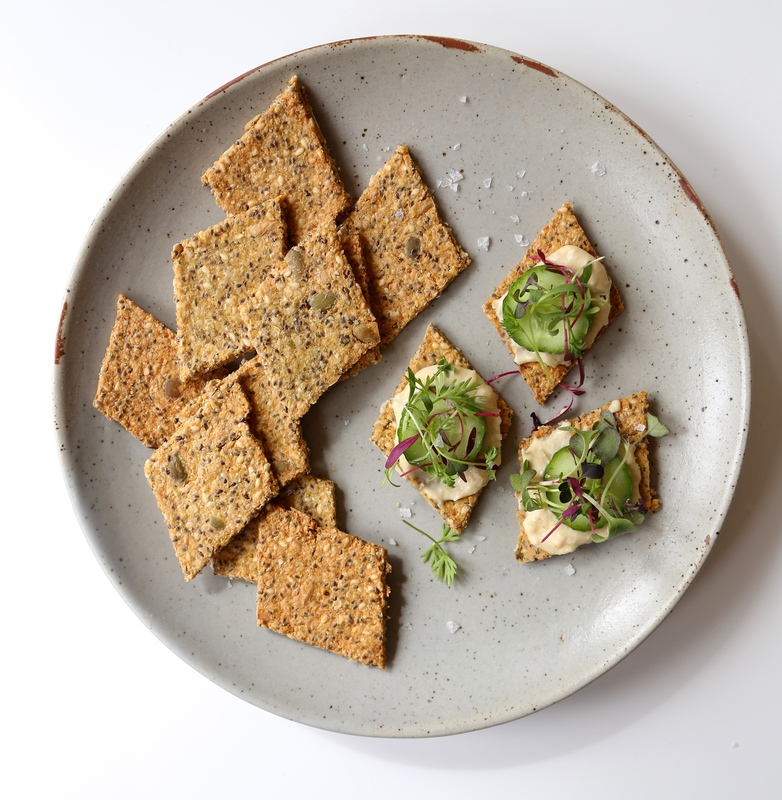 In the photo above, I served these crackers with hummus (obviously), baby cucumber, and zesty micro-greens. An elegant and super simple way to serve these crackers. Place quinoa in a food processor and pulse until mushy. Add the remaining ingredients plus 1 tbsp of water and pulse until a ball begins to form. Roughly form dough into a flat rectangle about an inch thick. Place the rectangle on to a piece of parchment paper fitted for a baking tray. Using a rolling pin and plastic wrap, roll out the dough to about a 1/8 inch thin rectangle, putting the plastic wrap between the rolling pin and mixture. Using a sharp knife or pizza cutter, cut the dough into a diamond shape about 1.5 inches in diameter. You can achieve a diamond shape by cutting the dough parallel, 1.5 inches apart, and then cutting diagonal, 1.5 inches apart. Any excess dough can be rerolled and recut. Bake the crackers for 15 minuts. Flip and bake for an additional 15-20 minutes, until golden and crispy. This entry was posted in Snacks and tagged all natural, ayurvedic, gluten-free, healthy, nourish, quinoa, seeds, superfood. Bookmark the permalink.